Winners of the second season (2014). L-R: Liu Wenfei, Alexander Nitzberg, Marian Schwartz, Alejandro Ariel Gonzales. Prize purse of over $5,000 attracts over 150 international applicants. The organizers of the biannual Read Russia Prize have received 156 applications from translators and publishers from 28 countries including the UK, Austria, Germany, France, Italy, Spain, Portugal, Sweden, Turkey, Lebanon, the U.S. and Mexico. A record number of applications were received from France, Italy and the UK. 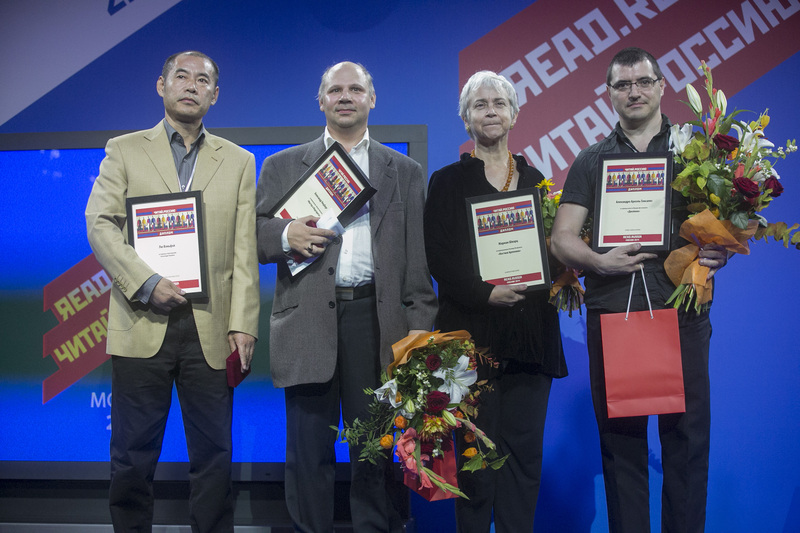 Translators - individually or as groups - compete in the Read Russia Prize to be recognized for the best translation of a prose or poetic work from Russian into a foreign language and published within the last two years (2014-2016). There are four nominations: Classic literature of the 19th century, literature of the 20th century (up to 1990), contemporary literature (from 1990) and poetry. A panel of judges is currently being formed. The list of finalists will be published no later than Aug. 20, 2016 and the winners will be announced on Sept. 10 at the International congress of translators in Moscow, to which than 300 translators from all over the world are invited. The main prize is €5,000 ($5,700) for the translator or group of translators and €3,000 ($3,400) for publishers to cover costs. The goal of the Read Russia award is to popularize Russian literature and to encourage foreign translators and publishers of Russian literature. Alessandro Niero (Italy) for Thirty-Three Texts (Terra Firma). Victor Gallego Ballestero (Spain) for Tolstoy’s Anna Karenina (Alba). Marian Schwartz (U.S.) for her translation of Leonid Yuzefovich’s novel “Harlequin’s Costume” (Glagoslav publications).